The IDF begins blocking critical Egyptian border crossings to stop infiltrators, but emphasizes there is no connection with the uprisings in Egypt. The IDF has begun blockading critical Egyptian border crossings to stop infiltrators, emphasizing there is no connection with the uprisings in Egypt. 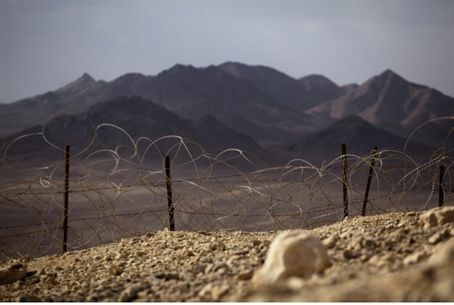 Military spokespersons also said the new blockades are not a replacement for the Cabinet-approved fence that is to hermetically seal the entire border with Egypt. IDF Engineering Corps soldiers are carrying out a pilot program of using a special type of fence to block the crossings traversed by tens of thousands of African infiltrators in recent years. The border crossing fence can be manufactured in two weeks. The fence, part of which will be put into place by Army helicopters, will be knife-edged and almost impossible to cross. “If this is effective as we think it will be, it will bring about a reduction in the number of infiltrators," said Engineering Corps officer Aran Eitan.